This latest offering from this seasoned Canadian Blues man Steve Kozak offers a tasty mix of Blues as seen through a decidedly West Coast lens. You only need three things to play the Blues: A good guitar, an innate understanding of the Blues and thirty years in which to do it. Steve Kozak qualifies on all three counts. The latest offering from this seasoned Bluesman offers a tasty mix of Blues as seen through a decidedly West Coast lens. The aptly, and strangely prophetically named new release is called It's Time. Putting in time is indeed a prerequisite of being a great musician, some veteran Bluesmen even attaining the status of venerable once they have put in enough time. Time is also about understanding the past. One cannot play American Roots music with conviction and credibility without a solid understanding of the evolution of the genre. Kozak is no staunch traditionalist however. Call him a revivalist if you will, with one foot firmly planted in the roots of the Blues and the other straddling the modern incarnation of the Blues. Cutting-edge digital technology is embraced and this cat swears by high tech Quilter amplifiers to deliver traditional, vacuum-tube tone. On this CD one can clearly hear the music that has inspired Kozak. This is the urbane sophisticated sound of late 1950's Blues that prevailed in Chicago and New York. This is when the Blues came of age and entered the pantheon of Americana. In Steve Kozak's tasty licks and sparingly used embellishments, one the can hear the influences of the likes of T-Bone Walker and Freddie King. Augmenting these well-crafted tunes is a group of unparalleled musicians. These accomplished musicians are usually his travelling band and the tight-knit ensemble transcend the live experience and lay it down in the digital domain. Bassist Roger Brant and drummer Chris “The Wrist" Nordquist form one of the most rock-solid rhythm sections this side of the Rockies. This unshakeable foundation makes this album groove along from start to finish. Rounding out the band is keyboardist par excellence Dave Webb. Dave has been known to wrangle the huge Hammond B-3/Leslie set-up at the now defunct Yale Hotel into submission. The keyboards on this particular album add a certain sophistication as well as a touch of R&B reminiscent of Atlantic Records' house session player, Van Walls. This new album is mix of fairly obscure covers and self-penned tunes. After several listening sessions it soon becomes apparent that Kozak is coming into his own as a talented songwriter. A cover of the very cool Brook Benton song Kiddio particularly appeals to me. With its catchy turn around and infectious melody, Kozak has put a real polish on this tune. The Magic Sam number Every Night and Every Day conveys a sense of immediacy and delves deep into the Blues. Kozak's own Trouble evokes a real Louisiana Bayou feel and could have been recorded in Eddie Shuler's garage at Goldband Records, but with less whiskey and more microphones. Then there is track 8, another Kozak composition, called That's Cool with Me. Anything with cool in the title is cool by me and this song does not disappoint. A rollicking R&B number reminiscent of the heyday of Specialty records with a hint of Louis Jordan; a real barn burner. Two tracks that stand out are Stranger in My Hometown and Goin' Fishin'. Both written by Steve Kozak, they are autobiographical and deeply personal. The former can be interpreted in several ways. One can think of Rock 'n' Rollers feeling out of place in rapidly gentrifying urban centres. In a broader sense it can also be indicative of the alienation the average working musician may feel in this digital age. The latter track is more straightforward and literal. It speaks of the simple joys of going fishing. If there is one thing that Kozak loves as much as guitar slinging, it's getting out on the water for a day of fishing. Maybe the Blues is as simple as that; catching a really big fish. All in all ‘It’ Time’ is a colourful palette of musical expression with a cohesive theme that gives a loving acknowledgement to that multi-faceted thing we call the Blues. still carrying the torch for the genre still working what’s left of the live music circuit for blues. Kozak keeps holding down residencies and workaday gigs because he clearly loves playing. 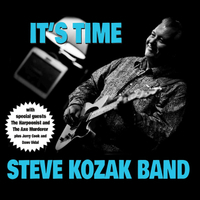 The dozen tracks on his new album, It’s Time, showcase the wide range of styles Kozak is an ace at. His original Cane Sugar Sweet is pure swinging Texas blues, while the version of “Magic” Sam Maghett’s Every Night And Every Day is dirty Chicago, all the way down to guest Shawn Hall’s overdriven harmonica. Naturally, the guitar work throughout is tasty and never oversteps into the realm of self-service that mars so much contemporary blues and all but destroys blues rock. One of the album’s most in-the-pocket riffs is on the original Trouble, which alternates between reverberating bayou backing rhythms and stinging leads. No blues guitarist/singer ever hits their best notes without seriously sympathetic backing bands. Pianist/organist Dave Webb and the rhythm section of bassist Roger Brant and drummer Chris Nordquist locks right into the job at hand. Live, they do it even better. The Harpoonist & The Axe Murderer’s Matthew Rogers, John Raham and Erik Nielson did a great job with the recording and Rogers’ production is in line with classic Kim Wilson albums. Not a bad thing at all. It takes decades to refine your blues chops into something other than the regular; perhaps even longer to be able to write originals that stand up next to the classics. The Steve Kozak Band pulls it off with It’s Time. Fans of classy blues will be pleased indeed. Thanks to the extremely dedicated folks at Canadian Pacific Blues Society and Co-Op Radio, It’s Time gets its release in the swinging Rio Theatre. One of the best venues in town for singer/songwriter and groovier styles, the Commercial Drive area is a fixture for a good reason. Like Kozak, it’s paid its dues and keeps on swinging.